Wildflower Wednesday March 2014: More of these please! It's the fourth week of March and time for Wildflower Wednesday when I join Gail at Clay and Limestone and other bloggers to highlight flowering native plants in our gardens. For March I'm featuring plants growing naturally around my area and native to South Texas that I'd like to see become established in my garden. 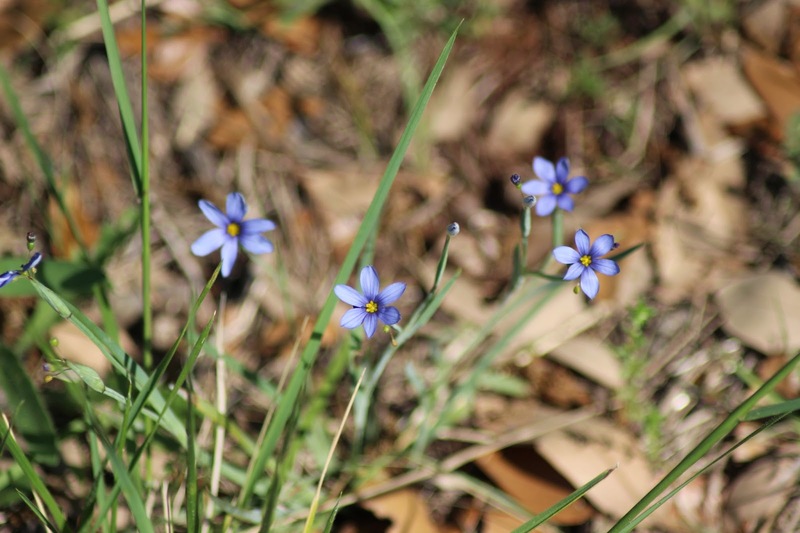 Last spring I discovered a small stand of Blue-eyed grass (Sisyrinchium angustifolium) along the creek behind the house. Pretty and delicate with bright blue blooms in the spring, I was so pleased to find this native member of the iris family growing naturally just a foot or so over the property line. Watching creatures of all types visit the garden is just one of the pleasures we gardeners enjoy. Late last week I discovered a hummingbird moth visiting the front yard and paused to watch its fascinating movements while enjoying the blooms of the Texas Mountain Laurel on a very windy day. We just built a cedar post fence which provides a deer-proof gardening area. We have no backyard fence to allow an unobstructed view of the dry creek area which we enjoy, but critters also feel welcome to wander in and browse the foliage. The new fence is not high, but deer avoid jumping into narrow and restricted spaces. So this fence will work well for allowing roses and other deer candy to be grown in this area, while also enabling an excellent view of the plants from the house and yard. 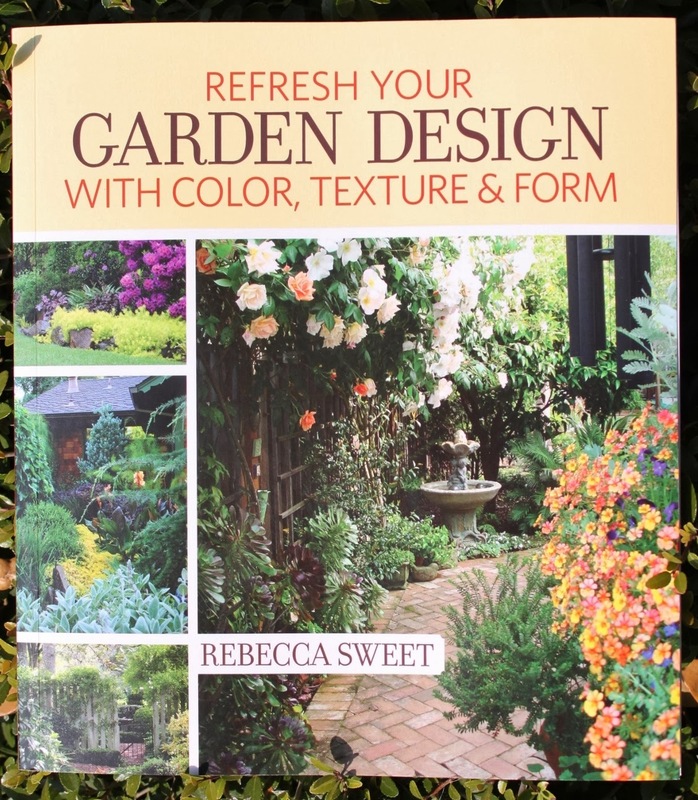 This week I'm reviewing Refresh Your Garden Design With Color, Texture & Form just in time for the spring garden spruce-up we look forward to each year. If you've had an exceptionally cold winter and lost quite a few plants like I have then this spring brings a good opportunity to make some changes to the garden. You might be thinking your garden doesn't look as pulled together as you originally envisioned or maybe you just know it's time to update your garden. At this point questions such as how to decide what to change and how to get started come to mind. Wouldn't it be nice to have a top-notch garden designer "visit" to share her ideas for bringing a fresh look to your garden? Even very good gardeners would welcome that opportunity. speaks to you as if she is visiting your garden to share her tips on how you can restore harmony to your own garden. Rebecca addresses the concept of "harmony in the garden" as what's often missing in gardens that aren't living up to expectations.